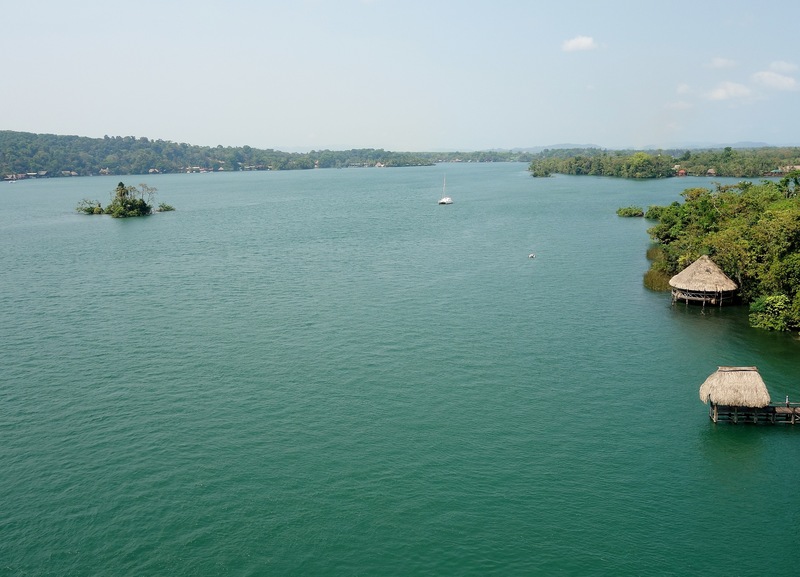 Rio Dulce is a sweet water haven surrounded by massive jungles that connects the enormous fresh water Lake Izabal with the open sea on the Caribbean coast. 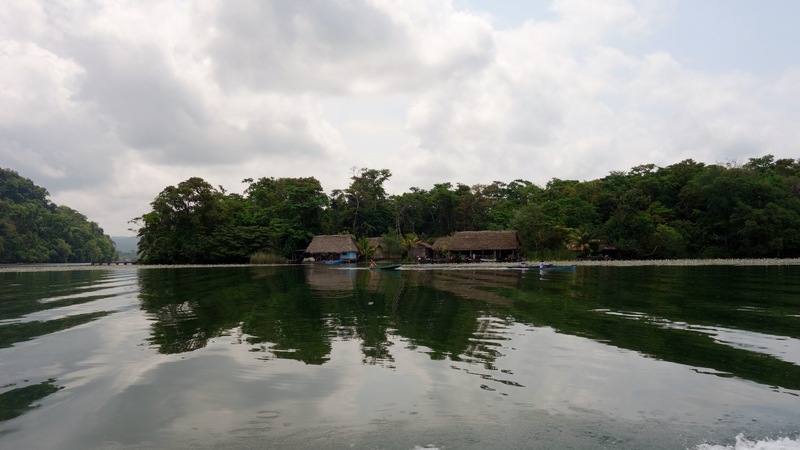 In contrast to the crowded, gateway town of Fronteras, the waters edge is spotted by small and isolated Mayan towns, a few eco-lodges and the weekend homes of Guatemala’s wealthy elite. Beautiful mansions complete with thatch roof ranchos covering enormous luxury boats shine a spotlight on the massively uneven distributions of wealth in this country. 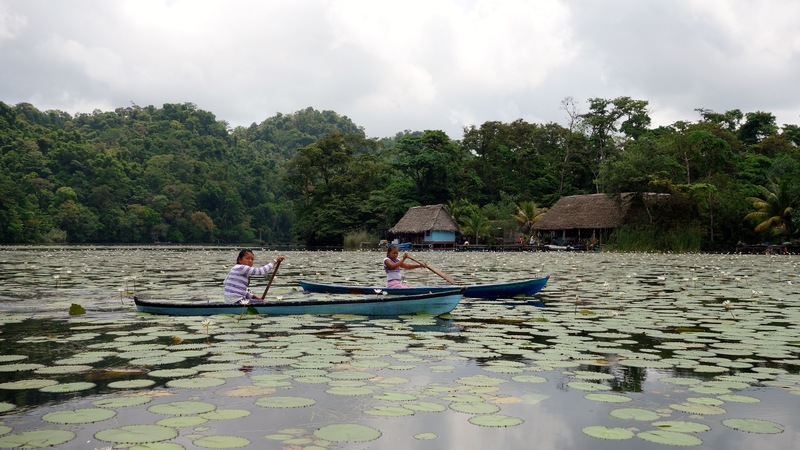 Several areas have been made into wildlife reserves, an important step in protecting the threatened and diverse wildlife of Guatemala. 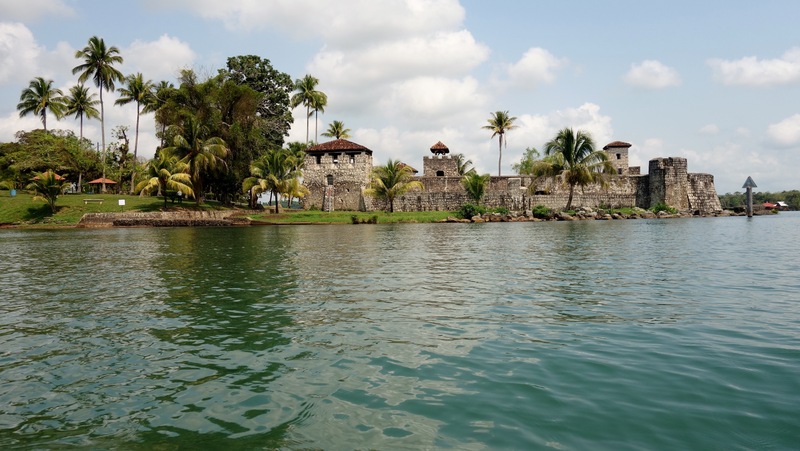 By far the most popular thing to do in Rio Dulce is take a lancha down the whole length of the river to Livingston. Private lanchas can be easily organized at the main dock in Fronteras or by your hotel. You get to choose your stops and decided how long to stay at each place. They start at Q300 per person. 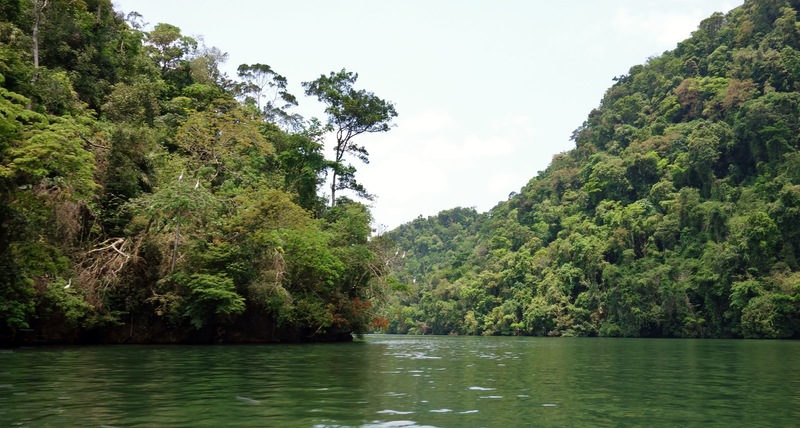 Otherwise, you can take the collective lancha leave twice daily for the 2 and half hour trip down Rio Dulce. (125Q one way 200Q roundtrip). They will even pick you up from your hotel. The boat ride is the single coolest thing to do in the area. The scenery is spectacular. 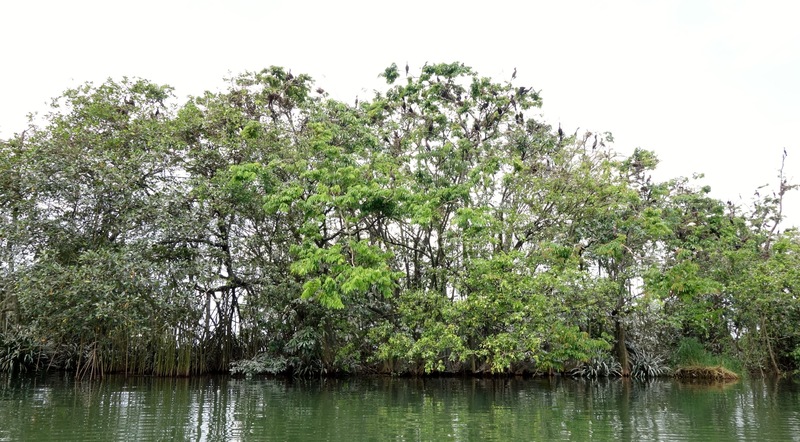 From watching the locals on their hardly stable looking cayucos fishing under lush jungles, to the possibility of manatee sightings, the trip is both relaxing and exciting. Spot the medieval castle of San Felipe, take a break at the (really) hot springs suitably called Aguas Calientes and float by the small river side Mayan villages where girls in tiny cayucos come up to sell you hand carved artesanias, sea stars and conch shells. *Remember you may not be allowed to bring these natural artifacts into your country. The awe-inspiring gorge will have you gawking at 100 metre high cliffs covered in tropical vegetation. Look for diminutive local fishing in the shadows of the brush. It’s sure to put the scale into perspective. April and I have a particular affinity for this place because in addition to it’s beauty, Rio Dulce is the home of Casa Guatemala, a school and orphanage with whom I have been volunteering for 5 years now. April and I even launched a fundraiser and mission to help support the 250 kids who depend on Casa Guatemala for living and education. The entire town centres around the only main highway passing through. The two lane road is often congested with not only automobiles, tuk-tuks, motorbikes and colectivos (local shuttle buses) shouting their destinations, but also transport trucks constantly emitting chocking clouds of exhaust. There is one main grocery story as well as small markets and ‘tiendas’(corner stores) to stock up before heading out to jungle. Even if you are not in the position to buy, check out the fish market behind the colectivo terminal. Local fishermen haul in the days catch from their dugout cayucos to be cleaned, weighed and sold at rock bottom prices. There are many small hotels, eco-lodges and fincas now offering stays on both the Lake and river side. Bookings generally have to be pre-arranged and the hotel will send a boat to pick you up at the docks (for a fee). Also remember that all your meals will have to be purchased from the hotels on site restaurant. 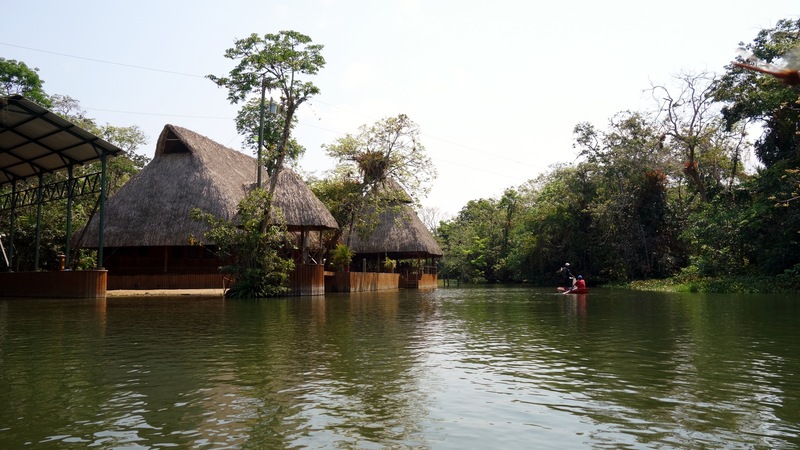 Finca Tatin offers a wide range of prices and accommodations as well as activities like kayaking, trekking through the jungle, a Mayan cave and a Mayan village project you can volunteer at. Dorms start at 50Q. River front bungalows at Q250 for 1 person. Hotelito Perdido, literally ‘the little lost hotel’ also has shared lofts from Q50 and numerous bungalows at Q200 for 1 person. Kayaks also available to rent. Hotel Kangaroo, tucked in a beautiful little estuary of the lake. Dorms start at Q70 and the boat is included. Watch out for crocs! Bruno’s Hotel Marina has dorms at Q50 and rooms at Q220-400 for one, depending on the season. They also have excellent, affordable western restaurant for that American style burger (Q30) you’ve been craving after your 100th rice and beans meal. And they have happy hour by the pool. (Rum & coke for Q14.) I highly recommend the Club sandwich (Q40). No wonder it’s where all the expats hang out. For volunteers and budget traveler, ask to be dropped off just before the bridge. From there, it’s a 5 minute walk to Hotel Backpackers. Buses directly to Rio Dulce leave from the Litegua bus station (15 calle 10-40 zone 1). 80Quetzales (about US$10) for 6-7 hours ride. The buses arrive and depart at the Litegua station just over Central Americas longest bridge. To/From Peten (Tikal/Flores): Fuente del Norte has direct buses from Q60. Buses and shuttles from other part of Guatemala also arrive on the main strip in Fronteras. 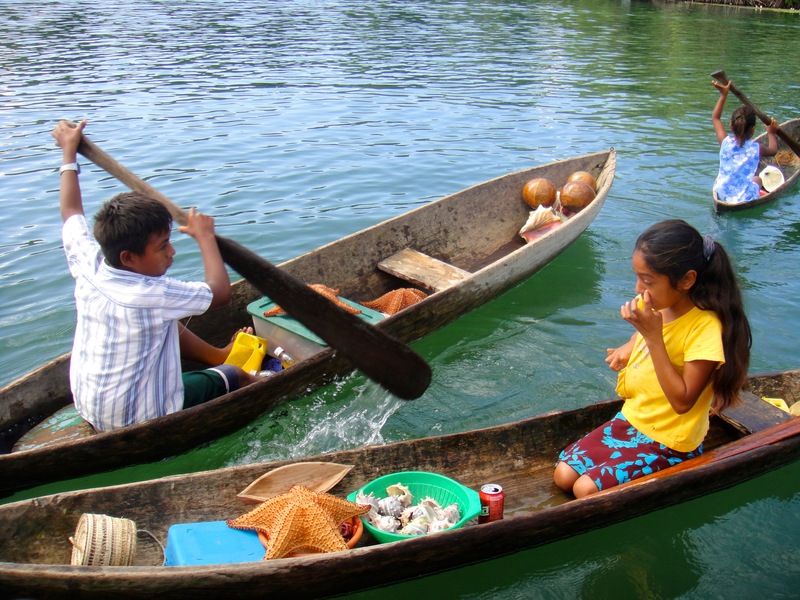 To/From Livingston: Lanchas from Livingston leave twice daily for the 2 and half hour trip down Rio Dulce. 125Q one way 200Q roundtrip. See part 1 for getting to Livingston from Belize, Honduras or doing the loop backwards from Guatemala City.